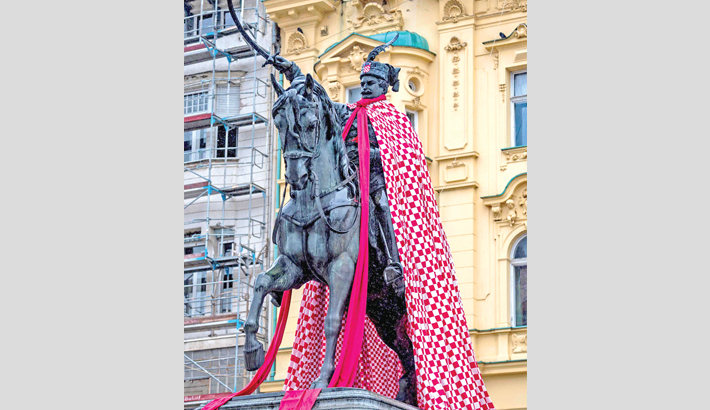 A statue in downtown Zagreb is covered with the national colours of Croatia on Sunday, ahead of their FIFA World Cup 2018 final match against France. A France fan waves a flag of his country at Red Square in Moscow on Saturday on the eve of their FIFA World Cup final against Croatia. Supporters of Croatia pose for a picture in downtown Zagreb, a few hours prior to the FIFA World Cup 2018 final between France and Croatia on Sunday. People wait in front of a giant screen at a fan zone in Nantes of France on Sunday ahead of the FIFA World Cup final.